Over the many years I have spent cooking professionally, I have noticed a pattern arise when cooking with family and friends. My mother has always commented on how much better a dish looks when I have plated it compared to when she has and credits my culinary training with that ability. Throw that notion out right now, it’s complete nonsense. There are no secrets to plating, no perfect ways, only what you find beautiful matters. I like to use a mixture of different colours and textures creating an abstract piece of art on whatever medium was chosen as a base. Start with a large wooden cutting board, a piece of slate, oddly shaped solid colour platters or individual dishes for an interesting canvas to paint on. Use brightly coloured sauces and condiments to streak or speckle your platter and add complementing flavours to whatever you are plating. Use delicate edible flowers or whole leaves of fresh herbs for a touch of nature. Choose items that complement each other in colour and flavour. There are no rules so be creative and have fun. You will be surprised at how professional your creations will look, no culinary diploma needed! Multi coloured cherry tomatoes skewered on toothpicks with cocktail bocconcini (seasoned with salt and pepper) and fresh basil leaves. Mixture of your favourite olives (I love Cerignola olives) and cornichons. 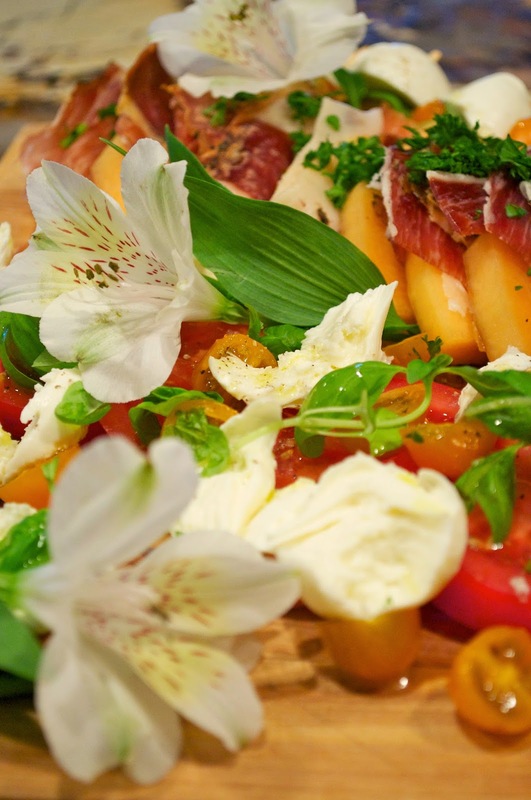 Heirloom tomatoes (sliced thick) alternating with creamy slices of mozzarella di bufala, fresh leaves of basil, drizzled with extra virgin olive oil and generously seasoned with freshly ground black pepper and salt. Dried saucissons, salami, rosette de Lyon and really anything that catches your eye! Savoury fruit compote, artisan mustards and different pickled fruits and veg are always fun to include in your mix. Your preferred pâté, ask your local butcher or grocery store for their recommendation if you aren’t familiar with it. A foie gras terrine is always a splendid choice.